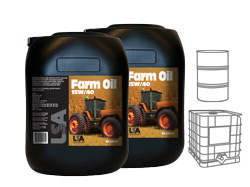 A special Super Tractor Oil Universal (STOU) oil specifically formulated to service tractors and other farm equipment with just one lubricant, where formerly up to four or more oils where required. Also suitable for manual gearboxes of cars, vans and light commercial vehicles where an API GL4 gear oil specification is required. Recommended for all engines; modern diesel 4-stroke, normally aspirated and turbocharged, as well as gasoline engines, transmissions, differentials, final drives, hydraulic systems, wet brakes and power take-off clutches. Hydraulic performance and gear performance satisfies the requirements of offhighway construction, transport, mining, industrial and marine equipment. Suitable for Diesel and Petrol engines.